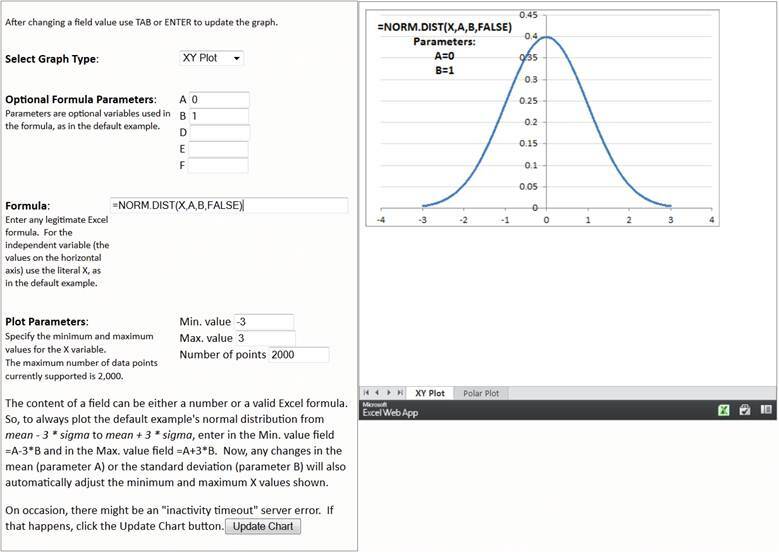 In Figure 1, the graph on the right is an Excel workbook shown through the Excel Mashup interface. The form on the left is part of the web page. Entering new information in the form will update the workbook and result in an updated chart. A functional web page is at http://www.tushar-mehta.com/publish_train/data_visualization/excelmashup/. We will go through all the steps to create this basic mashup. Most developers working with Excel use VBA or a .Net language such as VB or C#. The common paradigm for the languages, particularly in the context of legacy Office applications, is to assume that the code interaction with the application object is synchronous. There is some amount of asynchronous processing present, typically in the area of event handlers. But, even here, because of the legacy application, there is only one event handler active at any time. If multiple events occur at the same time, or if multiple handlers are waiting for one event, the application calls the event handlers sequentially. Consequently, the developer cannot store any information in *any* global variable as one might with VBA event handling, where, at the very least, there is an assurance that only one event procedure is running at any given time. Here’s an example. The design of the mashup described in this document creates a one-to-one association between textboxes on the web page and worksheet cells. The web page element (also called a DOM element) and the worksheet cell have the same name. When the user changes the content of a textbox, the code updates the associated worksheet cell with the new value. The DOM element declaration includes how to process the change event. A change in a textbox’s value causes the developer-written changeEvent function to be called. The argument, this, refers to the DOM object raising the change event. The changeEvent function, in turn, calls the getRangeA1Async method, which returns a range reference. The arguments to getRangeA1Async include the range id (address or name), the callback function, and the pass-through object. Since the DOM element and the worksheet range share the same name, the range identifier is the DOM element’s name (with the name of the activesheet concatenated in front). The callback function is updateRange. Finally, the pass-through object is the DOM element that triggered the change event. When the server calls updateRange (the callback function), it can access the pass-through object to figure out which DOM element triggered the original change request. With this architecture, the same changeEvent function and the same updateRange function can handle a change to any document element (as long as the document element and the associated worksheet range have the same name). In the updateRange function, rslt.getReturnValue() returns the range reference and rslt.getUserContext() returns the pass-through object. So, updateRange can set the value of the worksheet range to the value of the DOM element. It does so through another asynchronous call, this time to setValuesAsync. The same principle regarding asynchronous processing applies to setValuesAsync, i.e., include a callback function and a pass-through object. However, this time around, we don’t plan to process the result of the request. So we pass it an empty function named Dummy and a null pass-through object. Next, we look at a slightly more complex scenario where we will have multiple concurrent asynchronous calls in progress. This happens when retrieving information from the worksheet to update the values of all the web page elements. The elements on the left side of Figure 1 are part of a form named ChangeInput. The first function in the code below, getValuesInSheet, goes through each element in the form. For each element of type text, it initiates an asynchronous call to getRangeA1Async to obtain a reference to the range object with the same name as the text element. The callback function is getRngObj, and the pass-through object is the form element. To understand the special handling of the Func element, see the section Design the workbook. The callback function, getRngObj, builds a reference to the range object and initiates an asynchronous call to getValuesAsync. This time around the callback function is getRngVals. getValuesAsync does nothing more to the pass-through object than pass it through. Finally, getRngVals updates the value of the pass-through object with the returned value. Worth noting in the above example is that we did not have to worry about the different concurrent async processes. As long as each callback function is self-contained, i.e., it does not rely on a global that might change over time, the code will execute without problems. A good reference, particularly for those familiar with the Excel object model is Ewa Namespace (http://msdn.microsoft.com/en-us/library/ee589018.aspx). Its structure mimics that of the Excel OM. For example, there are methods (or properties) that are the equivalent of the Workbook property, the Sheets property, the Sheets(index) property, and the Range and the Cells properties. The sophistication and depth of EWA is nowhere near to that of the Excel OM. Will its sophistication grow? Or will Microsoft lose interest in the product and let it languish? I guess only time will tell. The workbook contains two worksheets named XY Plot and Polar Plot. The first contains the model to show a XY (or Cartesian) plot, the second to show a Polar plot. The names of these sheets are important because they must match the choices in the web page drop down. Also, keep a one-to-one association between web page elements (HTML DOM elements) and worksheet references. This will facilitate AJAX interactions. So, if there are adjacent cells that collectively represent, say, the parameters A, B, D, E, and F, resist the temptation to refer to the 5 cell range collectively as Parameters. Instead, name each individually so that there is a one-to-one association between a cell and its corresponding textbox. Use your Microsoft Live account to logon to skydrive.live.com. To create a workbook accessible to everyone, add the workbook to the Public folder. Then, select the file and from the choices on the right select Embed. In the Embed dialog box, select the Customize this embedded Excel workbook link. For more on the process, see http://office.microsoft.com/en-us/web-apps-help/make-a-mashup-extend-excel-to-your-web-app-HA102704192.aspx. The code from the previous section is the minimum necessary to use EWA. It stops at the point of initializing EWA after the web page completes loading. The developer has to write the code for all of the custom processing. The first script tag loads the Microsoft provided JS code to interact with the EWA. The second script tag is code that identifies the Excel workbook of interest (the fileToken variable), and initializes the EWA object. When all initialization is complete, the onEwaLoaded will be executed. Worth noting is that the fileToken string changes whenever a new version of the workbook is uploaded to Skydrive. So, even if one replaces file testWB1.xlsx with a new version of testWB1.xlsx, the identifier for the file will be different. So, each time you upload a new version of the workbook to Skydrive, you will have to get the new file token. * values from your Excel file and how to use the rest of the object model. myExcelDiv is the id for a HTML element that will contain the displayed chart. For more on the basic requirements for the web page, see http://msdn.microsoft.com/en-us/library/hh315812.aspx. First, we have to build the web page components. In this case, everything goes into a form named ChangeInput. The form occupies 40% of the width of the webpage. Each of the form elements has onchange code associated with it. So, whenever the content of a textbox or the drop-down selector changes, the corresponding code is executed. All of the work that the developer does starts with the onEwaLoaded function. The first thing to do is get a reference to the global ewa variable. In addition, I call the initializeWB function. 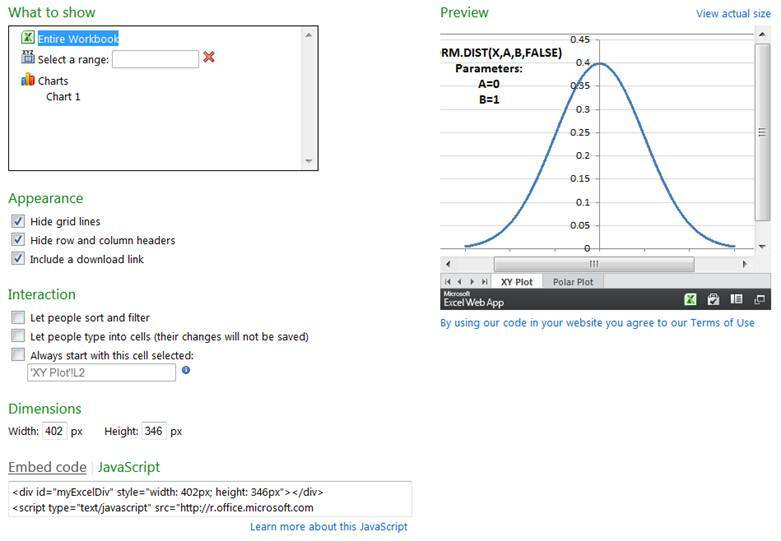 * Add code here to interact with the embedded Excel web app. * Find out more at http://msdn.microsoft.com/en-us/library/hh315812.aspx. The initializeWB function takes the information from the workbook and updates the various fields in the webpage. We have already seen how a change to the content of a textbox is handled (see Development Paradigm). Next, we look at how to process a change in the PlotType drop-down. 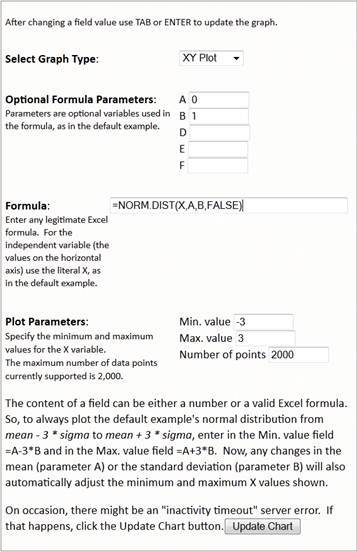 Since the workbook contains a different worksheet for each of the plot types, we have to get Excel Services to switch worksheets. Once that switch is complete, we will update the web page with the contents of the newly active worksheet. Any change in the selection of PlotType will result in a call to the selectPlot function with the parameter of this. selectPlot asynchronously requests a change in the active sheet providing sheetChangeDone as the callback function. When the active sheet change is complete, sheetChangeDone loads the content of the HTML form with the contents of the worksheet by calling the getValuesInSheet function. The code in getValuesInSheet is discussed in detail in Development Paradigm. When it comes to cells, the common way to protect cells is to lock those we do not want the user changing, leaving only those meant for user input unlocked, and then protecting the worksheet. Unfortunately, Excel Services will not work with a protected workbook! Luckily, a workaround is to hide all the cells in the worksheet as was done in the example workbook. Only those cells under the chart were left visible. This leaves one thing that the user can do and that is click on a sheet tab. Since sheet tabs cannot be hidden in Excel Services, there is no way to block such a click. To deal with the possibility that the user clicks on an arbitrary sheet tab, the code in changeEvent needs to check if the active sheet is the same as the one shown in the PlotType dropdown. If it is not, the code initiates a ‘change sheet’ request and defers the processing of the change event request until after the sheet change is completed. This document takes the reader through the steps required to create an Excel mashup. The final web page is at http://www.tushar-mehta.com/publish_train/data_visualization/excelmashup/index.htm. Once on that page, one can look at the complete source for the page and also download the associated Excel workbook.